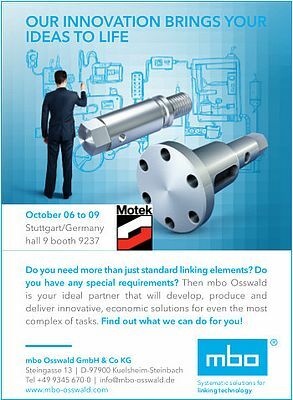 mbo Osswald – partner to industry! More than 12,000 standard parts and the skills needed to produce and deliver them quickly and in top quality. That is why we are the ideal partner for everyone who needs reliable linking elements – whether in small, medium or large runs. More than 12,000 standard parts and the skills needed to produce and deliver them quickly and in top quality. That is why we are the ideal partner for everyone who needs reliable linking elements – whether in small, medium or large runs. Find out what we can do for you! Mbo Oswald's aim is to be a reliable partner to the industry wherever linking elements and joint combinations of any type are needed. More than 12.000 standard parts in stock and specialized in manufacturing parts and components to drawings. For over 40 years mbo Oswald has been producing linking elements such as bolts, clevises, clevis joints, angle joints, ball joints, rod ends and retaining elements. Sea water & corrosion resistant, high temperature, high strength and duplex steel.